Medical Errors Disclosure: Is It Good or Bad? Background: In the treatment and health process, there are a lot of dangers to patients, and the increased number of medical errors is one of the most important circumstances of this process. Objective: The present research purposed to decrease medical errors through disclosure of them in hospitals of Tehran University of Medical Sciences. Methods: This qualitative-quantitative study included a population of 232 individuals, selected through targeted non-random selection, who were somehow connected with medical errors made in hospitals affiliated with Tehran University of Medical Sciences. The triangulation technique was utilized to collect data. Data was analyzed using the factor analysis technique. After the effective factors were determined, their internal correlation was determined through regression correlation. 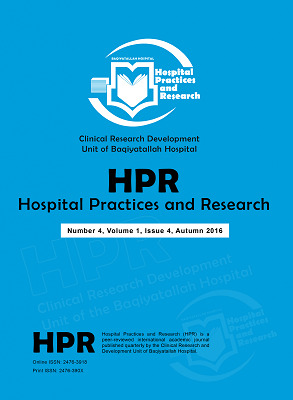 Results: Disclosure is made up of organizational culture, the factors related to the patient, the factors related to the presenter, the factors involved in the error, structural factors, and disclosure situation indexes, and is an effective factor in managing the medical errors in hospitals of Tehran University of Medical Sciences. Disclosure increases the immunity of patients. Conclusion: Disclosure is an effective factor in managing the medical errors that occur at hospitals affiliated with Tehran University of Medical Sciences. It is essential that managers identify the effective factors in disclosure and take steps to apply a suitable disclosure system to decrease errors. Yardley IE, Yardley SJ, Wu AW. How to discuss errors and adverse events with cancer patients. Curr Oncol Rep. 2010;12(4):253- 260. doi:10.1007/s11912-010-0109-0. Dabagh A, Akbari ME, Fathi M. Medical errors patterns in health care. Iran Islamic Republic Army Journal. 2006;4:957- 966. Inelmen EM, Sergi G, Enzi G, et al. On clinical errors in geriatric medicine diagnosis: ethical issues and policy Implication. Ethics Med. 2010;26:15-24. Mardani Hamole M, Shahraki Vahed A. Barriers of Medical errors reporting in nurses. Ethics Med Hist. 2009;2:56-60. Cao H, Stetson P, Hripcsak G. Assessing explicit error reporting in the narrative electronic medical record using keyword searching. J Biomed Inform. 2003;36(1-2):99-105. doi:10.1016/S1532-0464(03)00058-3. Kolaitis IN, Schinasi DA, Ross LF. Should medical errors be disclosed to pediatric patients? Pediatricians’ attitudes toward error disclosure. Acad Pediatr. 2016;16(5):482-488. doi:10.1016/j.acap.2015.06.011. Youngson GG. Medical error and disclosure - a view from the U.K. Surgeon. 2014;12(2):68-72. doi:10.1016/j.surge.2013.10.011. Kachalia A, Bates DW. Disclosing medical errors: the view from the USA. Surgeon. 2014;12(2):64-67. doi:10.1016/j.surge.2013.12.002. Hannawa AF, Shigemoto Y, Little TD. Medical errors: Disclosure styles, interpersonal forgiveness, and outcomes. Soc Sci Med. 2016;156:29-38. doi:10.1016/j.socscimed.2016.03.026. Heaton HA, Campbell RL, Thompson KM, Sadosty AT. In support of the medical apology: the nonlegal arguments. J Emerg Med. 2016;51(5):605-609. doi:10.1016/j.jemermed.2016.06.048. Disclosure of medical errors. Ann Emerg Med. 2004;43(3):432. doi:10.1016/j.annemergmed.2003.11.014. Ghajarzade M. Medical errors: doctors guide. https://www.tums.ac.ir/. Published 2009. [Persian]. Tsiga E, Panagopoulou E, Montgomery A. Examining the link between burnout and medical error: A checklist approach. Burn Res. 2017;6:1-8. doi:10.1016/j.burn.2017.02.002. Tevlin R, Doherty E, Traynor O. Improving disclosure and management of medical error - an opportunity to transform the surgeons of tomorrow. Surgeon. 2013;11(6):338-343. doi:10.1016/j.surge.2013.07.008. Abd Elwahab S, Doherty E. What about doctors? The impact of medical errors. Surgeon. 2014;12(6):297-300. doi:10.1016/j.surge.2014.06.004. Hannawa AF. Disclosing medical errors to patients: effects of nonverbal involvement. Patient Educ Couns. 2014;94(3):310- 313. doi:10.1016/j.pec.2013.11.007. Leone D, Lamiani G, Vegni E, Larson S, Roter DL. Error disclosure and family members’ reactions: does the type of error really matter? Patient Educ Couns. 2015;98(4):446-452. doi:10.1016/j.pec.2014.12.011. Giraldo P, Castells X. [Medical errors and the apology laws, do we need them?]. Med Clin (Barc). 2015;145(8):341-343. doi:10.1016/j.medcli.2015.04.019. Leape LL. Apology for errors: whose responsibility? Front Health Serv Manage. 2012;28(3):3-12. doi:10.1097/01974520-201201000-00002. Etchegaray JM, Gallagher TH, Bell SK, Dunlap B, Thomas EJ. Error disclosure: a new domain for safety culture assessment. BMJ Qual Saf. 2012;21(7):594-599. doi:10.1136/bmjqs-2011-000530. Ghalandarpoorattar SM, Kaviani A, Asghari F. Medical error disclosure: the gap between attitude and practice. Postgrad Med J. 2012;88(1037):130-133. doi:10.1136/postgradmedj-2011-130118. Kronman AC, Paasche-Orlow M, Orlander JD. Factors associated with disclosure of medical errors by housestaff. BMJ Qual Saf. 2012;21(4):271-278. doi:10.1136/bmjqs-2011-000084. Greene D. Nurses Experience with the Disclosure of Errors to Patient. College of Health and Human Science: Georgia State University; 2009. Vozikis A. Information management of medical errors in Greece: The MERIS proposal. Int J Inf Manage. 2009;29(1):15- 26. doi:10.1016/j.ijinfomgt.2008.04.012. Levinson W. Disclosing medical errors to patients: a challenge for health care professionals and institutions. Patient Educ Couns. 2009;76(3):296-299. doi:10.1016/j.pec.2009.07.018. Waite MA. Patient Safety and Disclosure of Medical Error: The Legal and Ethical Implications of Human Error in Medicine. Masters Abstracts. 2006;44:2152. Moskop JC, Geiderman JM, Hobgood CD, Larkin GL. Emergency physicians and disclosure of medical errors. Ann Emerg Med. 2006;48(5):523-531. doi:10.1016/j.annemergmed.2006.04.007. Chan DK, Gallagher TH, Reznick R, Levinson W. How surgeons disclose medical errors to patients: a study using standardized patients. Surgery. 2005;138(5):851-858. doi:10.1016/j.surg.2005.04.015. Fein S, Hilborne L, Kagawa-Singer M, et al. A conceptual model for disclosure of medical errors. Advances in Patient Safety. 2003;2:483-494. Kalra J. Medical errors: overcoming the challenges. Clin Biochem. 2004;37(12):1063-1071. doi:10.1016/j.clinbiochem.2004.08.008. Nekoei A. Nurse’s working shift work fatigue and errors. Summarized Articles of the Second National Conference on Prevention of Medical Errors; 2007;141. Fischer MA, Mazor KM, Baril J, Alper E, DeMarco D, Pugnaire M. Learning from mistakes. Factors that influence how students and residents learn from medical errors. J Gen Intern Med. 2006;21(5):419-423. doi:10.1111/j.1525-1497.2006.00420.x. Hartnell N, MacKinnon N, Sketris I, Fleming M. Identifying, understanding and overcoming barriers to medication error reporting in hospitals: a focus group study. BMJ Qual Saf. 2012;21(5):361-368. doi:10.1136/bmjqs-2011-000299. Moumtzoglou A. Reporting adverse events: Greek doctor and nurse attitudes. Int J Health Care Qual Assur. 2010;23(7):680- 687. doi:10.1108/09526861011071607. Hosford SB. The Impact of External Interventions on Improvising the Quality of Patient Safety in Hospitals [dissertation]. Tempe, AZ: University of Phoenix; 2007. Hoover DL. Exploring Military Physician Perceptions of Medical Error [dissertation]. Minneapolis, MN: Capella University; 2007. Walsh K, Antony J. Improving patient safety and quality: what are the challenges and gaps in introducing an integrated electronic adverse incident and recording system within health care industry? Int J Health Care Qual Assur. 2007;20(2-3):107- 115. doi:10.1108/09526860710731807. Thomas EJ, Petersen LA. Measuring errors and adverse events in health care. J Gen Intern Med. 2003;18(1):61-67. doi:10.1046/j.1525-1497.2003.20147.x. Uribe CL, Schweikhart SB, Pathak DS, Dow M, Marsh GB. Perceived barriers to medical-error reporting: an exploratory investigation. J Healthc Manag. 2002;47(4):263-279. doi:10.1097/00115514-200207000-00009. Harenstam KP, Elg M, Svensson C, Brommels M, Ovretveit J. Patient safety as perceived by Swedish leaders. Int J Health Care Qual Assur. 2009;22(2):168-182. doi:10.1108/09526860910944656.